"To escape this rocking weight, all I had to do—I thought—was draw my line." Allison Coffelt's debut memoir Maps Are Lines We Draw: A Road Trip Through Haiti recounts her travel through the island nation with Dr. Jean Gardy Marius, founder of the public health organization OSAPO. With just a month to go before Maps Are Lines We Draw releases, we sat down to chat with Allison about her travels, her influences, and her work. You can also add the book on Goodreads. 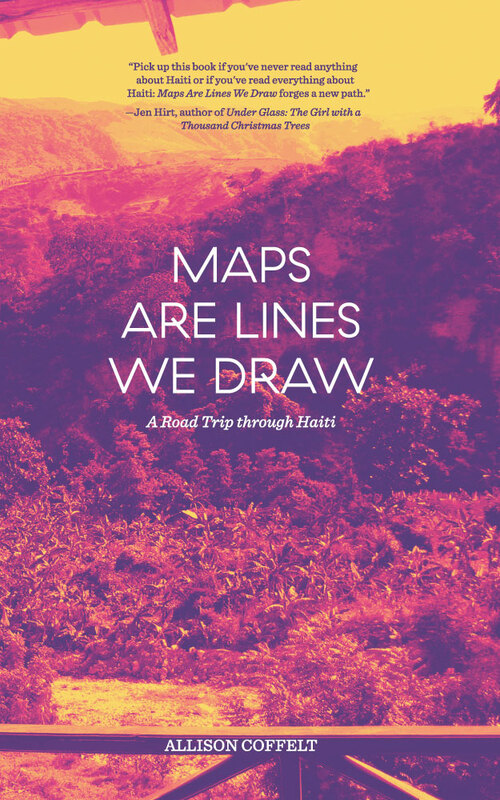 Maps Are Lines We Draw largely centers on your travels in Haiti. Tell us a little about other places you’ve traveled around the world. I was very fortunate growing up in that that travel was something my family valued and was able to do. I touch on this a little bit in the book – what it means to have what I think of as “geographic curiosity” at a fairly early age. While I’ve been able to travel to several places, it was doing research for this book that really gave me the opportunity to deeply think about what it means to travel, to travail, to (choose to) do that certain kind work. Travel requires, often, physical discomfort. And it means putting the body in settings that are unknown, where you’re not always sure how you’ll respond. All this, usually with the hope that in the end it will be worth it. When we choose to put ourselves in unknown or uncomfortable situations, I believe we learn something about ourselves and, just as importantly, about the world around us. There is a misconception, I think, that travel means you have to go far away. That’s not necessarily true, though this book is set nearly two thousand miles from where I live. Right now, I’m doing another place-based project that builds on what I’ve learned with travel, but is set a little closer to home. Who are some of the writers who have influenced your work over the years? The list is long. As one of the early readers points out, my journey to write this book begins with another book, Tracy Kidder’s Mountains Beyond Mountains, which I read at the formidable age of 15, and which sparked my interest in Haiti – and thinking about injustice and why things are the way they are. Since that book, there have been so many other writers who have been instrumental in the formation of my work. In terms of contemporary essayists, I’ve been influenced by Annie Dillard, Eula Biss, Claudia Rankine, Barry Lopez, Joni Tevis, Ta-Nehisi Coates, Maggie Nelson, and many others; I come back to books by those writers fairly often for guidance. Poetry – and writers who deeply care about the sound of language – have always been significant influences. I also have a deep appreciation for fiction. And, of course, there are many other writers who are long gone who have shaped my work. For this book, I read Vivan Gornick’s The Situation and the Story at a crucial time in my revision and it helped me greatly. I also work closely with the work and research of others: Peter Hallward’s Damming the Flood, Jonathan Katz’s The Big Truck That Went By, Mary Louise Pratt’s Imperial Eyes, Paul Farmer’s many books, of course Edwidge Danticat’s work, Susan Sontag, Pietra Rivoli’s Travels of a T-shirt, oral histories, in person interviews, and a lot of news reporting. I’m influenced a lot by nonfiction film, audio storytelling, and other forms of media. Where else can readers find you and your work before Maps hits the shelves in March? There’s a portion of the book up at Anchor Magazine, a publication from the wonderful folks at Still Harbor. I also have a piece in the Los Angeles Review of Books about Donald Trump, which I wrote during the election, but I think there’s still some relevance to it. Were I to rewrite it today, it would be a bit different, and far more urgent. There’s a piece of flash nonfiction up at Hippocampus called “Inheritance.” This year, I’m also doing more teaching and working with individuals on writing; you can find information about that on my website. Allison Coffelt lives and writes in Columbia, Missouri. Her work has appeared in the Los Angeles Review of Books, Hippocampus, Oxford Public Health Magazine, the Crab Orchard Review, museum of americana, Prick of the Spindle, the Higgs Weldon humor website, and the University of Connecticut journal of Contemporary French & Francophone Studies (SITES). She was a finalist in the 2015 Crab Orchard Review Literary Nonfiction Prize, the 2016 San Miguel Writer’s Workshop Essay Contest, and the winner of the 2015 University of Missouri Essay Prize. She currently works for True/False Film Fest, where she is the Education & Outreach Director and host of the True/False podcast.